He lived in New York with his wife, the linguist Janet Dean Fodor, and had two children. Fodor died on November 29, 2017, at his home in Manhattan. In his article "Propositional Attitudes" (1978), Fodor introduced the idea that mental states are relations between individuals and mental representations. Despite the changes in many of his positions over the years, the idea that intentional attitudes are relational has remained unchanged from its original formulation up to the present time[update]. Historically, questions about mental architecture have been divided[by whom?] into two contrasting theories about the nature of the faculties. The first can be described as a "horizontal" view because it sees mental processes as interactions between faculties which are not domain specific. For example, a judgment remains a judgment whether it is judgment about a perceptual experience or a judgment about the understanding of language. The second can be described as a "vertical" view because it claims that our mental faculties are domain specific, genetically determined, associated with distinct neurological structures, and so on. From the beginning of the 1980s, Fodor adhered to a causal notion of mental content and of meaning. This idea of content contrasts sharply with the inferential role semantics to which he subscribed earlier in his career. As of 2010[update] Fodor criticizes inferential role semantics (IRS) because its commitment to an extreme form of holism excludes the possibility of a true naturalization of the mental. But naturalization must include an explanation of content in atomistic and causal terms. ^ "Fodor, Jerry - Internet Encyclopedia of Philosophy". www.iep.utm.edu. ^ Shook, John. R. (2005). Dictionary of Modern American Philosophers. A&C Black. p. 817. ISBN 9781843710370 – via Google Books. ^ Norfleet, Phil. "Consciousness Concepts of Jerry Fodor". Academic Studies of Human Consciousness. Consciousness2007.tripod.com. Accessed 22 March 2010. ^ "LRB: Jerry Fodor". London Review of Books. Lrb.co.uk. Accessed 22 March 2010. ^ McGinn, Colin (2002). The Making of a Philosopher. New York: HarperCollins. ISBN 978-0-06-019792-6. ^ Fodor, Jerry. "Curriculum Vitae: Jerry Alan Fodor". Rutgers University. Ruccs.rutgers.edu. C. 2000. Accessed 22 March 2010. ^ "Jean-Nicod Prize and Lectures" Archived 2010-01-26 at the Wayback Machine. Jean Nicod Institute. Institutnicod.org. 2009. Accessed 22 March 2010. ^ "The Elm and the Expert: Mentalese and Its Semantics". MIT Press. Mitpress.mit.edu. Accessed 22 March 2010. ^ "Past Lectures" Archived 2011-07-20 at the Wayback Machine. University of Oxford Faculty of Philosophy. Ox.ac.uk. 2009. Accessed 22 March 2010. ^ "Prizes and Awards"[permanent dead link]. American Philosophical Association. Apaonline.com. 2009. Accessed 22 March 2010. ^ "APA Eastern Division: Officers & Committees 2005–2006"[permanent dead link]. American Philosophical Association. Apaonline.com. 2009. Accessed 22 March 2010. ^ "Edizione Cogsci – 2005". Mentecervello.it. Retrieved 2014-07-11. ^ Fox, Margalit (30 November 2017). "Jerry A. Fodor, Philosopher Who Plumbed the Mind's Depths, Dies at 82". The New York Times – via NYTimes.com. ^ a b c Fodor, Jerry A. (1981). Representations: Philosophical Essays on the Foundations of Cognitive Science. Cambridge, Mass. : The MIT Press. ISBN 978-0-262-06079-0. ^ Carnap, Rudolf (1947). Meaning and Necessity. Chicago: Chicago University Press. ISBN 978-0-226-09347-5. ^ Field, H.H. (1978). "Mental Representation". Erkenntnis. 13 (1): 9–61. doi:10.1007/BF00160888. ^ Harman, G. (1982). "Conceptual Role Semantics". Notre Dame Journal of Formal Logic. 23 (2): 242–256. doi:10.1305/ndjfl/1093883628. ^ a b Francesco Ferretti (2001). Jerry A. Fodor:Mente e Linguaggio. Rome: Editori Laterza. ISBN 978-88-420-6220-2. ^ a b c Fodor, Jerry A. (1983). The Modularity of Mind:An Essay in Faculty Psychology. The MIT Press. ISBN 978-0-262-56025-2. ^ Pearce, J.M.S. (2009). 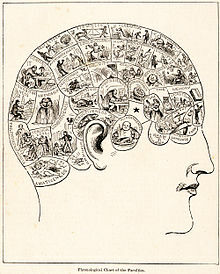 "Marie-Jean-Pierre Flourens (1794-1867) and cortical localization". European Neurology. 61 (5): 311–4. doi:10.1159/000206858. PMID 19295220. ^ Kerr, PB; Caputy, AJ; Horwitz, NH (Apr 15, 2005). "A history of cerebral localization". Neurosurgical Focus. 18 (4): e1. doi:10.3171/foc.2005.18.4.2. PMID 15844861. ^ Pinker, S (1997). How the Mind Works. New York: Norton. ^ Plotkin, H. (1997). Evolution in Mind. London: Alan Lane. ISBN 978-0-7139-9138-3. ^ Pylyshyn, Z. (1984). Computation and Cognition. Cambridge, Mass. : MIT Press. ^ Fodor, J. (2000). The Mind Doesn't Work That Way:The Scope and Limits of Computational Psychology. MIT Press. ISBN 978-0-262-56146-4. ^ a b c d e Fodor, Jerry A. (1990). A Theory of Content and Other Essays. The MIT Press. ISBN 978-0-262-56069-6. ^ Dennett, Daniel C. (1987). The Intentional Stance. The MIT Press. ^ Fodor, Jerry A. (1985). "Fodor's Guide to Mental Representations". Mind. 94 (373): 76–100. doi:10.1093/mind/xciv.373.76. ^ a b Fodor, Jerry A.; Pylyshyn, Zenon W. (1988). "Connectionism and cognitive architecture: A critical analysis". Cognition. 28 (1–2): 3–71. doi:10.1016/0010-0277(88)90031-5. PMID 2450716. ^ Cummins (1996). "Systematicity". Journal of Philosophy. 93 (12): 591–614. doi:10.2307/2941118. JSTOR 2941118. ^ Smolensky Paul (1987). "The constituent structure of mental states: A reply to Fodor and Pylyshyn". Southern Journal of Philosophy. 26: 137–160. CiteSeerX 10.1.1.468.755. doi:10.1111/j.2041-6962.1988.tb00470.x. ^ a b c Fodor, J (1978). RePresentations. Philosophical Essays on the Foundations of Cognitive Science. Mass. : The MIT Press. ^ a b Fodor, J. Holism: A Shopper's Guide, (with E. Lepore), Blackwell, 1992, ISBN 0-631-18193-8. ^ Putnam, Hilary (1988). Mind, Language and Reality. Cambridge University Press. ^ Fodor, Jerry. "The Mind/Body Problem". Scientific American (244): 124–132. ^ "Did Charles Darwin get it wrong?". Independent.co.uk. 2010-01-29. Retrieved 2014-07-11. ^ "What Darwin Got Wrong". 2010-02-06. ^ Blackburn, S. (1984). Spreading the Word. Oxford University Press. ^ Dennett, D.C. (1981). Brainstorms: Philosophical Essays on Mind and Psychology. MIT Press. ^ a b Bach, Kent. "Concepts: Where Cognitive Science Went Wrong. By Jerry A. Fodor (book review)". ^ Pustejovsky, J. (1995). The Generative Lexicon. MIT Press. ^ Fodor, J. (1998). Concepts: Where Cognitive Science Went Wrong (PDF). Oxford University Press. p. 54. ISBN 978-0-19-823636-8. Archived from the original (online PDF text) on 2006-09-12.